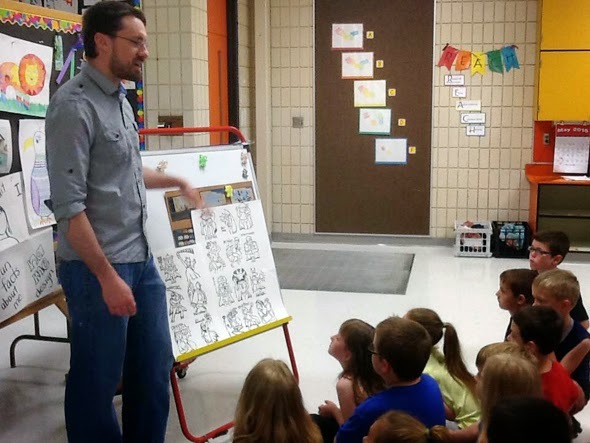 I spent last week with Lynn Darda, at Eastern Pulaski Elementary School in Winamac, IN as a visiting artist. I taught her students about linocut and relief printing and we made our own block printed coloring books. last time i visited winamac we painted a huge quilt mural on the wall representing the things in town that people gravitate toward. it was one of my most successful community based mural projects as we had lots of input from students, teachers, and community members alike. then we had plenty of volunteers to help paint the mural as well. so i was excited to go back and work with these kids again. 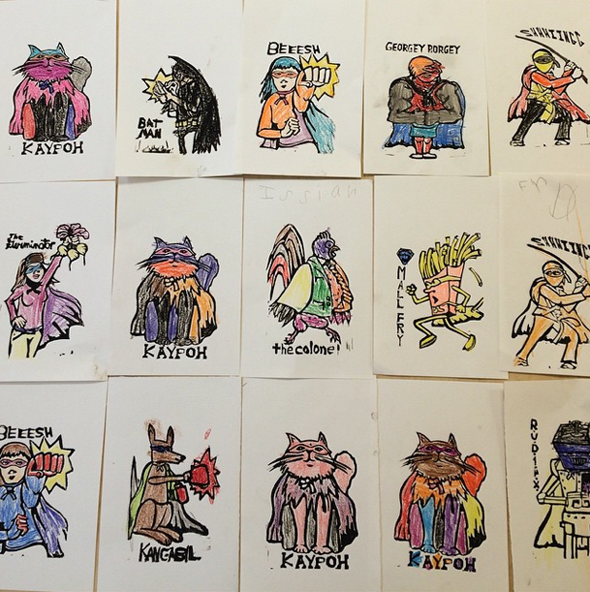 I decided that superheroes would be a fun theme for the kids, and i thought it would be something interesting for them to wrap their heads around. so all 600+ kids at the school got to do a project revolving around that theme. The 3rd, 4th and 5th graders got to cut and create their own images and the kindergartners, 1st, and 2nd graders used my images to print their coloring books. i cut 18 different superhero blocks for the kids to choose from, then we folded a sheet of paper into a little zine, and printed them. the results were fantastic little coloring books, that the students were all really excited about. the older kids shared their images and made numbered print books using each others blocks, in the spirit of collaboration. Lynn and her husband Don Darda do so much for the kids in their school system. it's a rural community and a small school, and it was amazing when Lynn told me that they had received more than 50 graduation invites from kids. they've made such an impact on their community and when i get to go and spend a week with them and their students, that impact is visible in the way the kids faces light up when they see either of them. sometimes it is really difficult to get kids to understand the importance of the arts in a rural community, but Lynn and Don do it so well, and their community shows it. it is quaint and quiet, and thoughtful, and that is a testament to their ability to encourage and inspire their students. teaching is a hard job, and teachers are the superheroes of our generation. i'm honored to get to work with Lynn and Don and all the kids they inspire on a daily basis. Thanks for the kind words, sniff..sniff. We LOVED having you. 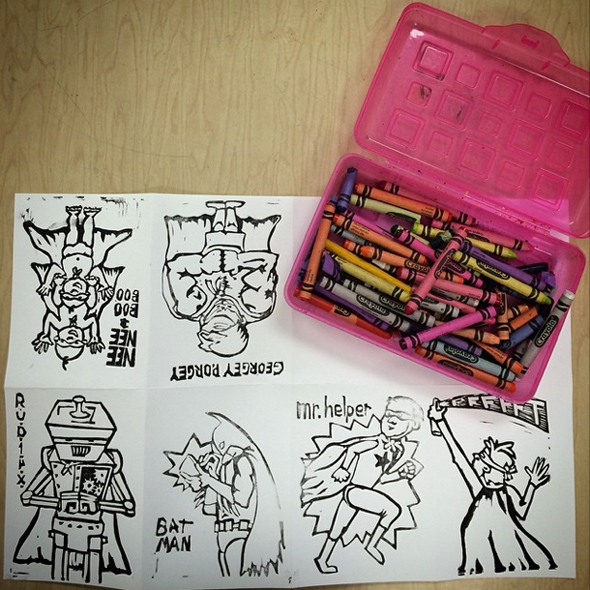 I know you worked long, hard hours and you brought a bit of "art magic" to our EPES so you are the super-hero!